The project intends to install a new traffic signal at the intersection of US 29 and CR 182 (Molino Road) and close the median just north of the US 29 / Molina Road intersection at the Dollar General Store. 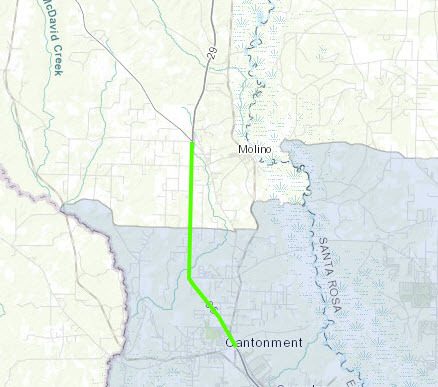 Additional improvements will include; milling and resurfacing US 29 from just south of Muscogee Road / Becks Lake Road to Atmore Highway, a total of eight miles, and perform safety and operational improvements at CR 196 (Barrineau Park Road), CR 184 (West Quintette Road) and the Molino Forestry Station. The improvements include Americans with Disability Act improvements, turn lanes, median opening and driveway modifications. Right of way is required for the turn lane improvements at CR 184(Muscogee/Becks Lake Road intersection. The project is funded for construction in Fiscal Year 2019. Data current as of 02/1/2018.